Well, I guess that title says it all. I'm uploading these pictures and post straight from Picasa - a very convenient feature (... hope it looks good)! 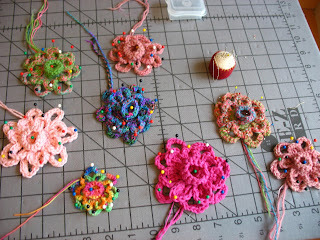 Top pic shows flowers being blocked - I didn't care for the crumpled look they were in when finished. 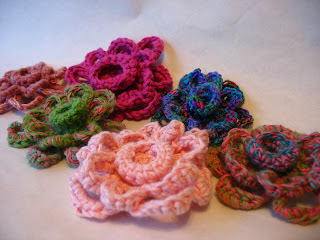 The pattern is the Amelia Flower Corsage from Roman Sock and another way I'm working on my Stashalong de-stashing! I made a few changes to the pattern to simplify it for my lazy self.